Amsterdam, June 4, 2018 - SkyTeam, the global airline alliance, has reached a milestone in the development of advanced technology enhancing its current tech hub with new functionalities. 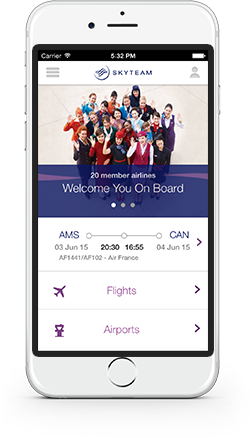 Unique to SkyTeam and known as the SkyLink Digital Spine, the new functionality is intended to gradually facilitate the 20 members of the alliance to exchange seat maps and cross-sell ancillary products. Ultimately, it will help member airlines solve common travel pain points and offer customers greater simplicity and convenience when flying across multiple SkyTeam members. The SkyLink Digital Spine will bridge the technology differences between members, allowing for the format translation and exchange of messages. Thanks to the SkyLink Digital Spine, it will now become possible for the customer to seamlessly book free seats, paid for seats and other ancillary products for all legs of their journey, regardless of which SkyTeam member they booked their ticket with. The Seamless Ancillaries Program is just one benefit that will positively impact customers following the development of the Digital Spine. Delta and Aeromexico will be the first to take advantage of the technology, gradually rolling-out the product from mid July 2018. Customers booking via the airline’s website will be able purchase seat products at their own convenience, for their entire journey when flying on an itinerary with the two airlines. Designed in response to customer feedback and airline member input, the new functionality forms the backbone of the alliance’s many progressive technical initiatives. Application of The Digital Spine will be significantly expanded over the next three years. Gradually more members will use the platform on interline itineraries to e.g. capture and find baggage, provide seamless check-in, supply all boarding passes, show real-time availability of seats and enable the purchase of ancillary types with miles. The development comes as research commissioned by SkyTeam identified a lack of seamless ancillaries as one of the top travel gripes for frequent travelers. Already a successful year for innovations, 2018 has seen SkyTeam implement and develop several technology-driven products in response to its customers’ needs. SkyTeam Rebooking, officially launched in January, is an innovative technology solution designed to reduce inconvenience caused to customers by flight delays, cancellations, and diversions. Already helping thousands of customers during irregular operations at 43 airports worldwide. SkyTeam recently launched airport maps, designed to help customers find their away around SkyTeam’s global hubs, reducing stress and making the transfer process smoother. How does Seamless Ancillaries work? SkyTeam has developed a new functionality on its already existing SkyLink Technology Hub called the SkyLink Digital Spine. The technology translates messages between airlines using NDC technology (IATA Standard). In practice, a customer flying on an interline itinerary (two or more SkyTeam member airlines on the same trip) will be able to book common travel add-ons via the marketing carrier’s website. Currently on some interline itineraries customers can’t book seats and bags with the second carrier, so they may end up with a seat they don’t want or end up wasting time and / or money at the airport booking bags. A customer has booked with Delta flying from Atlanta to Mexico City via Monterrey in Mexico. Half the journey is with Delta and the second half is with Aeromexico. The customer is booking their flight on delta.com. Thanks to SkyTeam’s seamless ancillaries’ program the customer will be able to see, select and / or purchase, the Aeromexico ancillary products (e.g. seats) without leaving the Delta website. The customer has saved time, and has guaranteed their seat for all legs of their journey. SkyTeam has worked together with TCS (Tata Consultancy Services) to develop the Digital Spine Infrastructure to transform messages & exchange these between members which are connected to the Digital Spine. SkyTeam is the global airline alliance with 20 member airlines working together to offer seamless travel on an extensive global network. SkyTeam customers can unwind in 600+ lounges as they travel, earn and redeem Frequent Flyer Miles. SkyTeam Elite Plus customers are eligible for SkyPriority services. The 20 members are: Aeroflot, Aerolíneas Argentinas, Aeroméxico, Air Europa, Air France, Alitalia, China Airlines, China Eastern, China Southern, Czech Airlines, Delta Air Lines, Garuda Indonesia, Kenya Airways, KLM Royal Dutch Airlines, Korean Air, Middle East Airlines, Saudia, TAROM, Vietnam Airlines and Xiamen Airlines. SkyTeam welcomes 730 million customers each year on more than 16,609 daily flights to 1,074 destinations in 177 countries.